Alphonse Weill was born, cira 1853, in Wolfisheim, Bas-Rhin, Alsace. Henrietta Weill (née Levy) was born in San Francisco in 1863. She studied kindergarten teaching methods under Kate Douglas Wiggin. In 1870, Alphonse Weill immigrated to New York City. From New York City, Weill took the train to San Francisco, intrigued by romance of American mining. 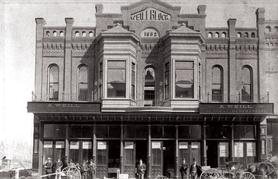 Weill headed to Havilah in the San Juaquin Valley, where he worked at his uncle Henry Asher’s hotel for room and board. 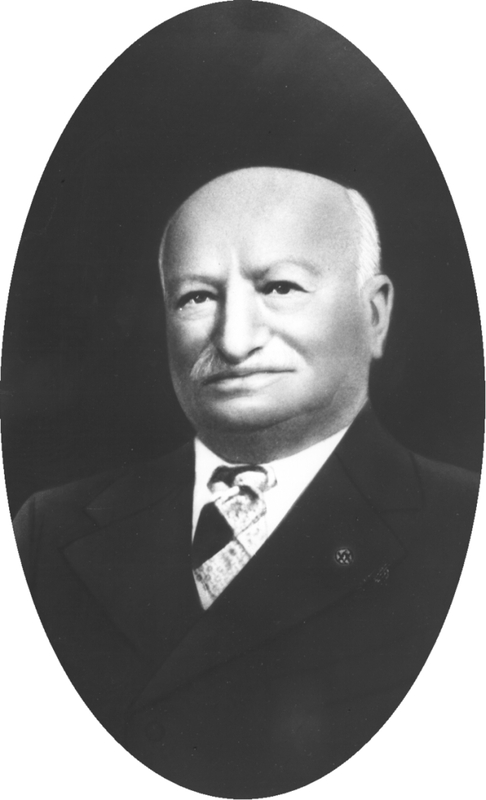 In 1872 ,Henry Jastro referred him to work at Jacob Weil’s General Store in Bakersfield (German; no relation). Weill soon became a Partner, and, by 1875, was the sole owner of the store – know known as A. Weill’s, and eventually as Weil’s Department Store. His younger brother, Samuel Weill, was briefly a partner. 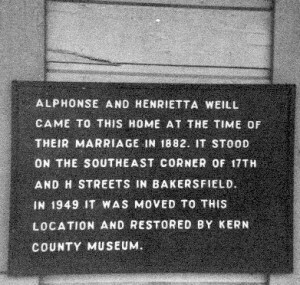 Alphonse Weill was one of the original stockholders of the Southern Hotel, the Bakersfield Water Works, and a principal owners and incorporator of the Jewett Oil Company. Alphonse Weill was a member of the Masons in Bakersfield Lodge, F. & A. M., the Benevolent Protective Order of Elks, and the Eagles. Henrietta Weill was a member of the Woman’s Club of Bakersfield, and the Club’s president in 1903-1904. She was also a supporter of the Children’s Home Society, Kiddie Camp, and Kern County Musical Association. Alphonse Weill’s most notable Jewish “statement” was closing his business on Yom Kippur. Henrietta Weill started the first kindergarten in town in Bakersfield, encouraging mothers to take on the expense of hiring of kindergarten teacher for the Bakersfield School System. In 1917, Henrietta Weill established a local Red Cross chapter and started a children’s shelter. The Henrietta Weill Memorial Child Guidance Center provides mental health and substance abuse services and the resources necessary to promote wellness and recovery for Kern County children, adults and families. Weill House, built in 1882, was moved in 1949 to Bakersfield’s Pioneer Village and bears a historical marker. The house was considered “modern” for its day because of the high ceilings, long hallway, and indoor plumbing. There is also a Weill Park in Bakersfield. Henrietta Weill died, in 1941. Alphonse Weill died in, 1945. In 1952, Weill’s Dept. Store was sold. In 1882, Alphonse Weill married Henrietta Levy, sister of Isaac Levy, whom Weill met at the Alliance Francaise in San Francisco. They married in San Francisco and honeymooned in Los Angeles. 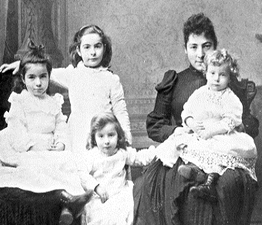 Henrietta Weill and her four children. Together, they had four children: Blanche, Irma Adele (b. 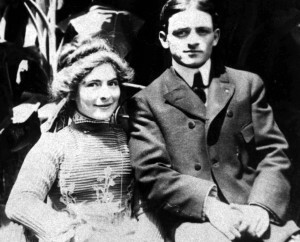 1886, died at 17), and Lawrence (b. 1889). 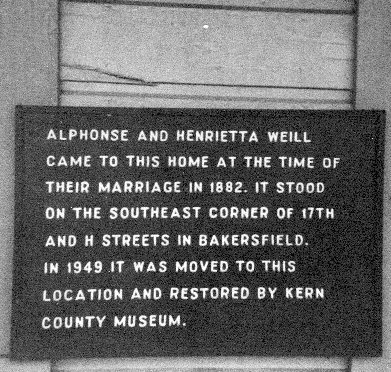 In 1882, Alphonse had a house built for Henrietta with indoor plumbing. 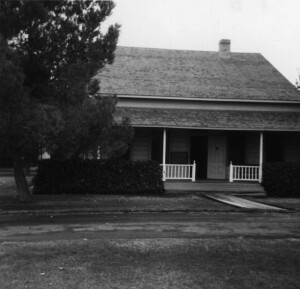 This home was a center of Bakersfield society. In 1911, Alphonse read about Dr. Marie Montessori in a magazine. The entire family traveled to Italy to meet her and observe her school. Blanch and Irma Weill stayed in Italy for a year to study with Dr. Montessori. Blanche Weill (1883-1974) Graduated from University of California and Harvard, worked with Dr. Spock and Dr. Adler, and authored two books on child development and a children’s book. She was the psychologist for a children’s home in Flint, Michigan for many years, and worked with mentally handicapped children in the Bakersfield schools. Eventually, Blanche set up in private practice in New York. Irma Weill (1885-1976), earned a masters degree at Smith to be psychiatric social worker and started the first Montessori School in California. Author of About Tom, she translated a children’s book from the French with her sister, Blanche. She was an active member of the newly formed Sierra Club. Irma is interred in Greenlawn Cemetery, Bakersfield. Shirley Ann Newman, We Brought Sinai to San Joaquin, The Story of the Jews of Kern County (Bakersfield: Temple Beth El, 1998). Annie R. Mitchell, Pioneer Merchants of Tulare County, California, Western States Jewish Histroical Quarterly 2/3. “Jewish Businessmen of the Counties of Fresno, Tulare & Kern Counties,” from Memorial and Biographical History of the Counties of Fresno, Tulare & Kern, California (1891), reprinted in Western States Jewish History 34/4. Regina Merwin is curator of this Weill Family exhibit.